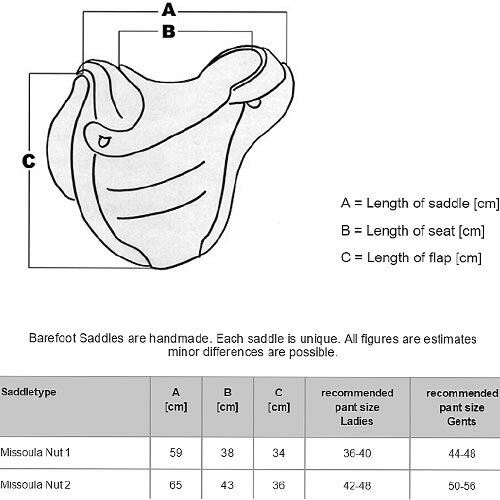 Barefoot Missoula Nut Western Treeless Saddles are stunning authentic western style saddles that are completely flexible and horse friendly. This saddle is made with high quality Brazilian leather and beautiful tooling. The removable seat is made with goat suede leather, and the underside is colored matched thick fleece. The Barefoot Treeless western saddles come with a standard wide size fiberglass insert. You can purchase additional medium, or extra wide Barefoot Western Pommel Inserts. You can also use the soft pommel inserts as needed for your horse's conformation, with the Barefoot Saddle Horn for decoration. Click here for more information on the Barefoot Western Pommel Inserts, and a printable version of the pommel sizing template.